Typically the first step in a divorce case is for one party to file for divorce or, in legal jargon, file a Petition for Dissolution. 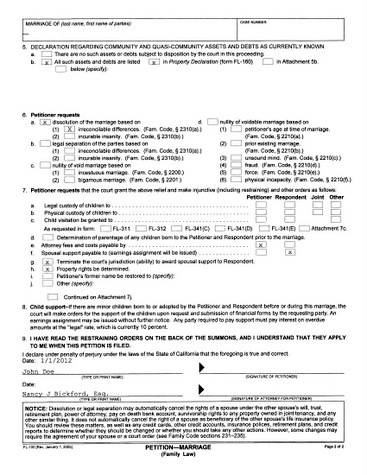 The filing and proper service of the Petition triggers a deadline for the other party (“responding party”) to file and serve a “Response” to the divorce petition. The responding party is in “default” if he or she fails to file a response (or other appropriate motion) within the time allowed to respond to the Petition for Dissolution (usually thirty days from service). Despite the requirement to file a response to a request for divorce within thirty days, the parties can agree to extend the deadline if they wish. Divorce attorneys are well versed in drafting a Petition for Dissolution, and their advice is invaluable in this regard. 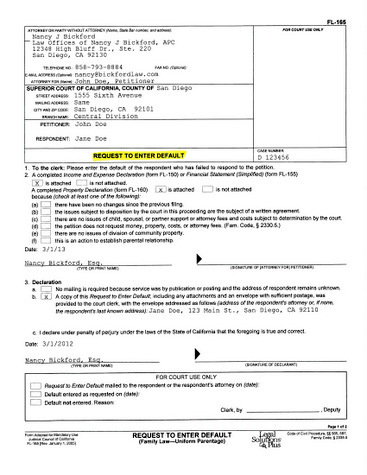 If the Respondent does not file any appropriate paperwork within the time frame to respond, the filing party (“Petitioner”) can ask his or her divorce attorney to file a request to enter default. If the clerk determines all of the appropriate conditions exist to enter default, default will be entered and a “prove up” hearing will be scheduled. Following the hearing, the judge will enter a default judgment. It is important to note that the judge cannot grant any relief not specifically requested in the divorce petition. For example, if the Petitioner’s attorney did not indicate on the divorce petition that the Petitioner would request spousal support; spousal support will not be ordered in the default judgment. The purpose of this rule is to provide proper notice to the defaulted party. The scenario described above is the typical scenario that the term “default” invokes. However, in a San Diego divorce case, it may be in the best interest of the parties to agree to proceed by a different method of “default”. It is not uncommon in a family law case for divorce attorneys to help the parties reach an agreement regarding all issues and formalize the terms of their contract in a Marital Settlement Agreement (“MSA”). An MSA can be filed with the court, entered as a court order, and become a binding agreement. If the parties settle all issues in an MSA, they will not need to appear in court to seek resolution. In order to formally begin the divorce process, one party MUST file and properly serve a Petition for Dissolution. 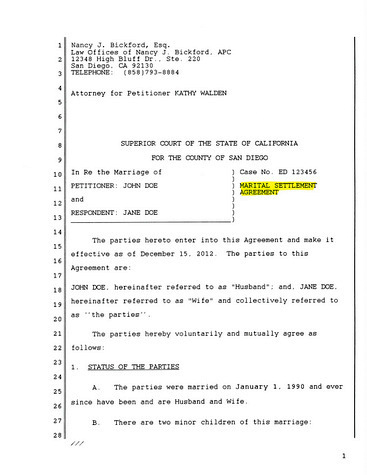 The filing fee to begin a divorce exceeds $400 in San Diego. Once one party has filed for divorce, the parties may agree to take an amicable approach to resolution of all issues and can agree to delay the deadline for the responding party to file a response. 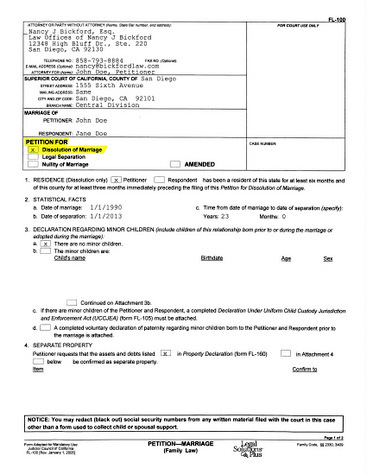 The filing fee to file a response to the divorce is also over $400. If the parties enter into an MSA before the responding party has filed a response, the parties can agree to proceed by default. 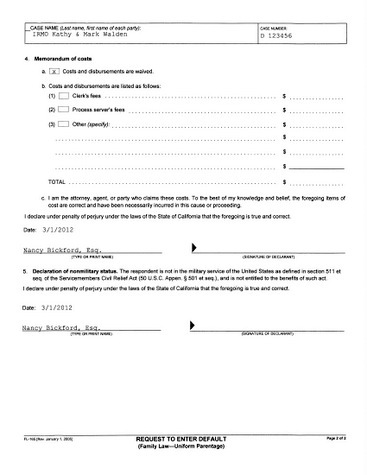 In this case, the responding party is not required to file a response or pay the corresponding fee. This amicable way to approach divorce can save the parties the cost of filing fees/miscellaneous court costs and also puts a positive spin on the term “default”. Contact Bickford Blado & Botros if you are contemplating divorce or legal separation. Nancy J. Bickford is the only attorney in San Diego County representing clients in divorces, who is a Certified Family Law Specialist (CFLS) and who is actively licensed as a Certified Public Accountant (CPA). Don't settle for less when determining your rights. Call 858-793-8884 for more information about the consultation process at our office located near Del Mar and Carmel Valley.